For an uncrowded, unique natural adventure, Lassen Volcanic Park fits the bill. There's the ominous sounding Bumpass Hell Nature Trail and Devil's Kitchen, but there is an amazing variety of scenery in this area, from beautiful to bizarre. Driving the 30 miles on Lassen Park Road you can see the natural diversity of the area. From forests to meadows to the blue green Emerald Lake, every turn is a different and spectacular view. One of the park's most popular hikes is the Bumpass Hell Nature Trails which climbs along an ancient volcano. Boardwalks take you over bubbling mudpots and clouds of steam rising from deep within the earth. The Kings Creek Falls Trail winds through the pines and first to a beautiful 50 foot high waterfall and presents views of the valley and the Devil's Kitchen, another geothermally active area in the region. The historic 100-year-old Drakesbad Guest Ranch with rooms and cabins still lit by oil lamp has horseback riding, and a small hotspring-fed pool. This is also a great area to begin a day hike to other interesting areas like Boiling Springs Lake or Devil's Kitchen, full of mudholes and fumaroles. In Chester: Bidwell House has 14 rooms www.bidwellhouse.com (530) 258-3338 Drakesbad Guest Ranch with 19 rooms and cabins and price includes 3 meals/day (530) 529-1512. Beneath Lassen Volcanic's peaceful forests and gem-like lakes lies evidence of a turbulent and fiery past. 600,000 years ago, the collision and warping of continental plates led to violent eruptions and the formation of lofty Mt. Tehama (also called Brokeoff Volcano.) 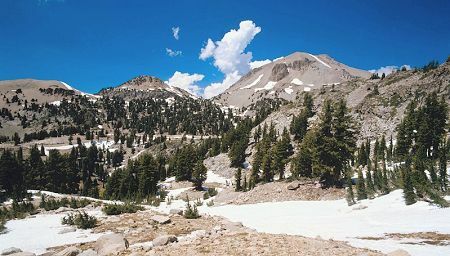 After 200,000 years of volcanic activity, vents and smaller volcanoes on Tehama's flanks-including Lassen Peak-drew magma away from the main cone. Hydrothermal areas ate away at the great mountain's bulk. Beneath the onslaught of Ice Age glaciers, Mt. Tehama crumbled and finally ceased to exist. But the volcanic landscape lived on: in 1914, Lassen Peak awoke. The Peak had its most significant activity in 1915 and minor activity through 1921. Lassen Volcanic became a national park in 1916 because of its significance as an active volcanic landscape.